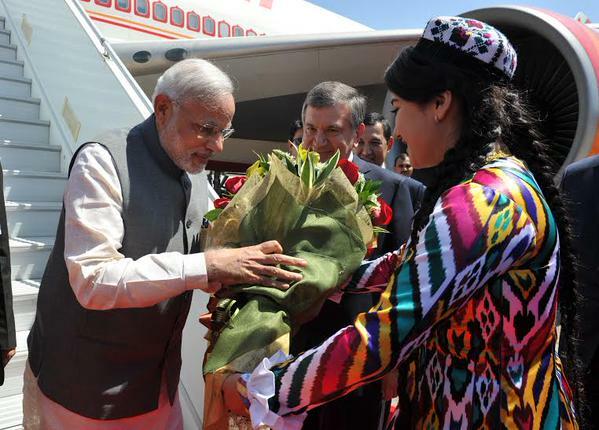 Indian Prime Minister Narendra Modi was on Monday received by Uzbekistan Prime Minister Shavkat Miromonovich Mirziyoev as he arrived Tashkent in the capital on the first stop of his Central Asian tour. “Salom Uzbekistan! PM @narendramodi arrives in the historic city of Tashkent on the first leg of his Central Asia tour,” tweeted external affairs ministry spokesperson Vikas Swarup. “Prime Ministerial Reception. PM Shavkat Miromonovich Mirziyoev himself receives PM @narendramodi at Tashkent Airport,” he said.